A project to discover and celebrate the hidden cultural heritage of Walthamstow's silent cinema industry. 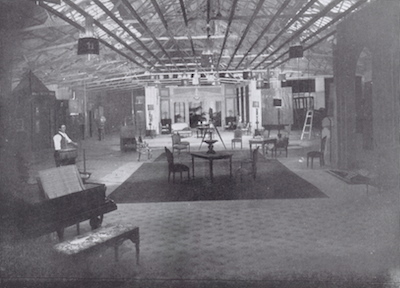 The Cunard Film Company Limited moved into their purpose-built studio at 245 Wood Street in October 1914. The studio had a 115 foot by 45 foot glass roofed daylight stage with extra lighting from 30 Westminster arc lamps. Broadwest finally went into receivership in 1921 and although other smaller companies took possession of the building at various stages The building itself was demolished sometime before the 1950's. I.B. Davidson converted an old horse tram shed at 588 Lea Bridge Road. Davidson’s studio was a "dark stage" studio making it unique in the area in that they used artificial lighting exclusively. Two of their original stars were the legendary “Bombadier” Billy Wells and Victor McLaglen. McLaglen got his start in film acting appearing in The Gay Corinthian after being persuaded by producer A E Colby to give up boxing as a profession. Like B&C they fell victim to Black November and by the end of 1924 were out of business. The already established British and Colonial Kinematograph Company, who by 1914 were one of the top six film companies in Britain. They moved into what was a former roller skating rink at 317-319 Hoe Street (now a BT Exchange). Early in 1910 the Gobbett brothers, who had formed The Precision Film Company in 1908 had a film studio built at 280 Wood Street, at the junction with Lea Bridge Road. This studio, The Precision Film Studio was the first purpose built film studio in Walthamstow. The two-story building overlooked Epping Forest which came right up to the East of Wood Street in those days. Success of the studio was short-lived and by 1915 it closed (which may or may not have been connected to the untimely death of one of the brothers at the age of 34) and by 1919 it was operating as a tool factory. The building itself was finally demolished, probably in the 1950's and on it's site now stands Beuleigh Court. Between 1910 and 1926, 400 silent films were made by four film studios, located on around Wood Street, E17, including the 1916 classic The Battle of the Somme. Many important actors first appeared in Walthamstow films including Victor Mclaglen, a John Ford stalwart who went on to win an Oscar for his role in The Informer and the famous Hollywood star Ronald Colman also launched his career was at Broadwest films. The studios were situated in Walthamstow outside the "fog zone" away from the pollution and gawping crowds film makers experienced in the city. They were also close enough to the city for actors to be back in time for evening performances in the west end theatres. 6) Precision was the first film company to establish a base in Waltham Forest. Precision's Director was AE Radcliffe and specialised in short films plus British "features"
7) IB Davidson was situated in Lea Bridge Road. The former tram shed enjoyed the work of producers AE Colby and Arthur Rooke who produced films around boxing, horse racing and "low life"
11) British & Colonial Kinematograph company existed from 1913 to 1924. The move from East Finchley to Hoe Street to a converted roller skating rink in Hoe street which now hosts the Telephone Exchange building.